Indianized kingdoms, which flourished in the SE Asia centuries back, have left a lasting Hindu legacy in the present day countries such as Cambodia, Indonesia, Laos. Vietnam has its representative in the My Son temple complex. In this travelogue, I will be writing about my travel to My Son temple complex located in Central Vietnam, about an hour from Hoi An by bus. I traveled to Vietnam and Cambodia in May 2016 with an aim to explore the Dharmic heritage. Saran, my husband, had been there in 2009 and his stories about these places provided me the impetus. But Saran was throwing the wrench, afraid of letting me travel alone, worried about my safety until he picked up the courage in 2016. As for my experience, I would say Vietnam is a very safe place even for single women to travel as I couldn’t help myself comparing it with India. To give the background, My Son, an UNESCO site, represents the Hindu faith which existed here between the 4th and 14th centuries CE. Champa people who were practicing Shaivaites and still do today built these exquisite temples which is in ruins today, some of which is being restored. My Son temple complex is dedicated to Lord Shiva and King God called “Bhadreswara”. 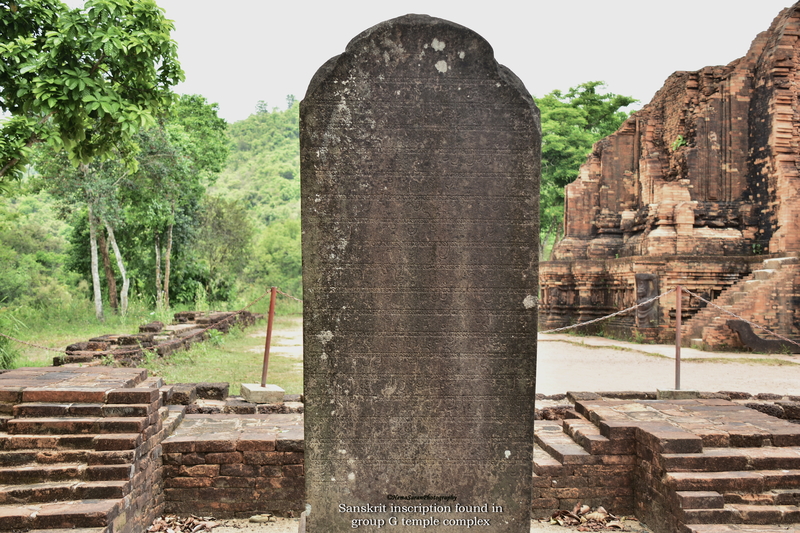 The people of Champa Kingdom (Cambadesa in Sanskrit as per the inscriptions there) called Chams today form the ethnic minorities in Cambodia and Vietnam. Vietnamese Chams are called Eastern Chams. These are one of the few non-Indian ethnic groups who follow Hinduism outside of India today, the others being the Balinese and Tenggerese Hindus in Indonesia. They are spread across the Ninh Thuan province, Binh Thuan province, South west Vietnam, Cambodia and Malaysia. 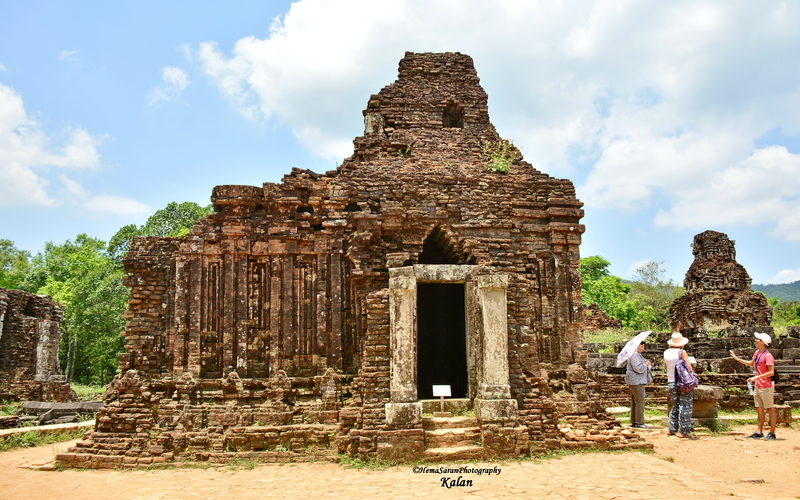 The Chams of Binh Thuan and Ninh Thuan provinces follow both Hinduism and Islam. Over time Cham Hinduism became a blend of different beliefs. Currently there remains only vestiges of the Indian Hinduism. Abandoning most of the Hindu practices, they now believe in ancestor worship, deified royalty and praying to local Gods. The modern day Chams are one of the 54 ethnic groups of Vietnam and retain their own language, script, religious customs and beliefs. My Son itself was consumed by the agents of denudation after the 14th century CE with the decline of the Cham kingdom to keep the discussions succinct. French soldiers traversing through the jungles of Vietnam in the late 1800’s discovered My Son accidentally. Henry Parmentier, the French archaeologist started with the restoration work of My Son which took him 4 years to complete. From 1931 to 1942, My Son and Po Nagar (another region under Cham Kingdom) temples were restored. In 1965 the Vietnam war broke and My Son temple complex was used as the communication center by the guerillas in 1966-68. Mines were planted all around the place and the American soldiers started to carpet bomb the entire My Son temple area to destroy the communication center. The craters of the B-52 bombing have not been filled but left visible for people to see the destruction of wars. The temple groups of A1 & E4 of My Son were completely razed to ground and many other groups of temples were seriously damaged. The whole area after the war had to be painfully cleared of the mines resulting in 9 deaths and several maimed people. 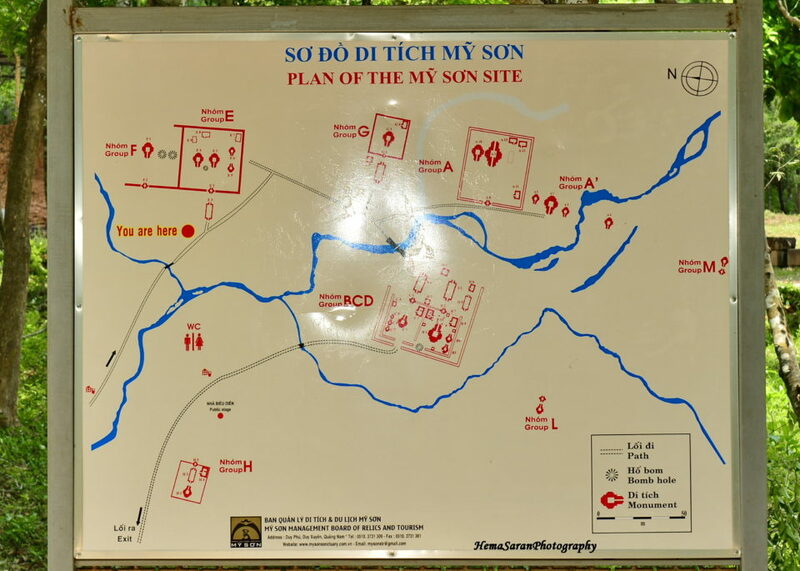 The bomb holes, bomb clusters, mines and broken shells bear testimony to ravages of Vietnam war. Before I dwell into details, there are 3 structures of Champa architecture which is needed for the understanding of the next few paragraphs. Kalan is a sanctuary in the form of a tower and houses the deity. A Mandapa is similar to the Mandapams in Indian temples, a roofed walkway which connects to the Kalan. A Gopura is again similar to the Gopuram in Indian temples, which is the entrance with roof leading into the complex. A Kalan or Sanctuary which houses the deity. My Son temple complex is a group of 8 temple complexes scattered across 142 hectares of the Cat’s tooth mountain. It was built between 4th and 14th Century CE. Originally there were 70 buildings but after many wars, there are only 20 buildings standing today. Conservation and restoration work is on for the rest of the buildings, many of which were destroyed during Vietnam war. The Complex is arranged in groups of temple complexes; namely A, B, C, D, E, F, G.
B7 to B13 are the secondary temples surrounding the main Kalan. These 7 temples are dedicated to Navagrahas. The temples are for Surya, Chandra, Agni, Varuna, Indra, Isana, Sani. Some of these sculptures are in display at Da Nang museum. The Navagrahas were carved out in the 10th Century CE and were greatly influenced by the Javanese and Khmer arts. 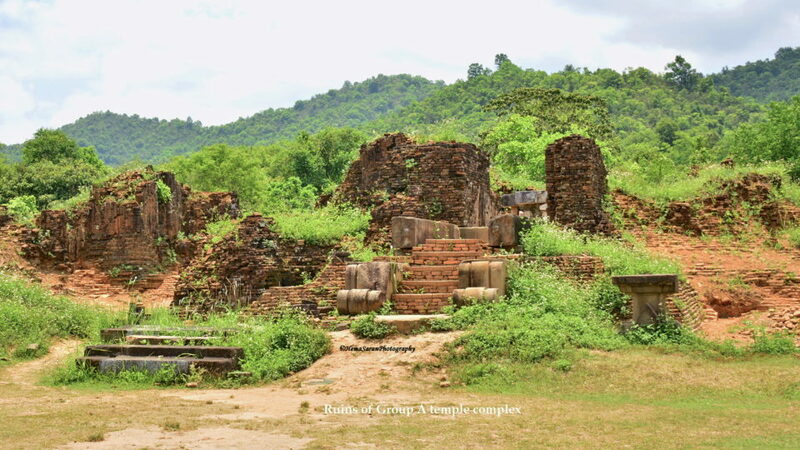 Most of the B7 – B13 temples are destroyed. The D1 is the Mandapa in the Group B temples. Group C – Kalan C1 was originally built in A1 style but later rebuilt in Hoa Lai style. It is a temple dedicated to standing statue of Lord Siva. C2 is the gate tower, C3 the reservoir for offerings, C4 served as a kitchen. C5, C6, C7 were smaller Kalans. D2 is the Mandapa and D3 is the Stele tower. Kalan C7 is considered as a connection between Hoa Lai and Dong Duong style. It is believed to be built at the end of 8th and beginning of 9th Century. Part of Group B, C, D complex with its unique Linga. Group E – Kalan E1 faces the East and is badly destroyed. E2 is the gate tower. E3 is the Mandapa. Kalan E4 faces the east. Kalan E5 and E6 are smaller temples, archaeologists discovered a 4 armed statue of lord Ganesha near temple E5 (currently displayed in the Da Nang museum). This also authenticates the fact that the temples in group B and E were dedicated to lord Shiva. Kalan E7 the the reservoir for temple offerings. Group F – It has a single Kalan, a gate tower and a small temple. This is an important temple as we see the transition from My Son style construction to Hoa Lai style construction. In the main sanctum sanctorum, a perfectly preserved, beautifully decorated Linga complete with a Jata survives till date. 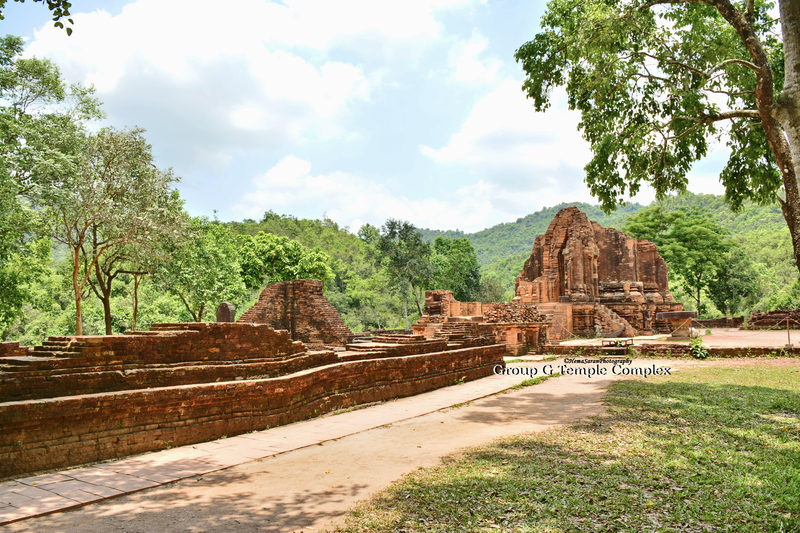 Group G – It has 5 temples in the group. G1 Kalan faces the west and had 2 more entrances on the side. The entrance gates are like arcades shaped like crossed spears and the corners of the Tower’s base are carved with masks of Kala the god of time. G2 is gate tower, G3 is the mandapa and G4 is a Kosargrha or the fire tower. Group H – This group of temples is built on a hill. H1 is the Kalan. H2 mandapa, H3 gate tower, H4 was the reservoir built for offerings. 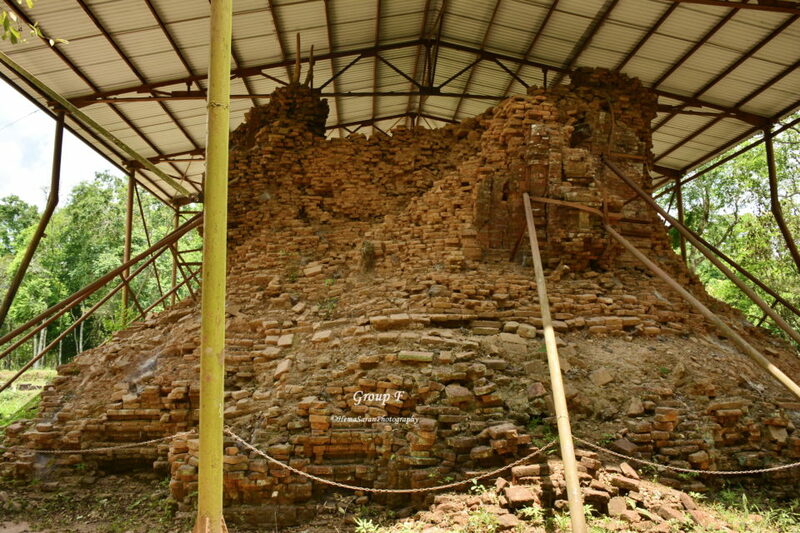 The whole group of temples were destroyed during the Vietnam war. The unique feature of this group of temples was there was a large tympanum with a carving of eight handed dancing Shiva. 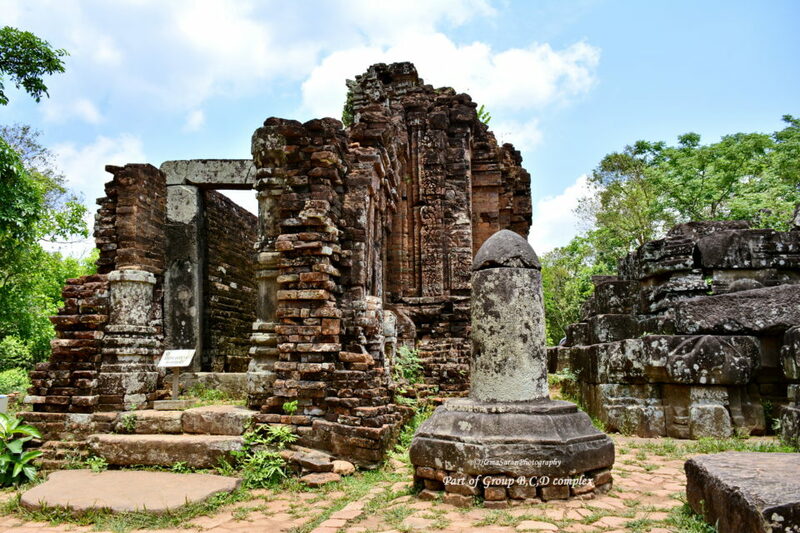 This temple bears influence of the early Khmer art. Group K – It has a small Kalan facing east built in the 11th century. This temple also bears a unique feature. The goddess Brahmi, a sakthi form of lord Brahma is carved sitting on a lotus onto the tympanum. 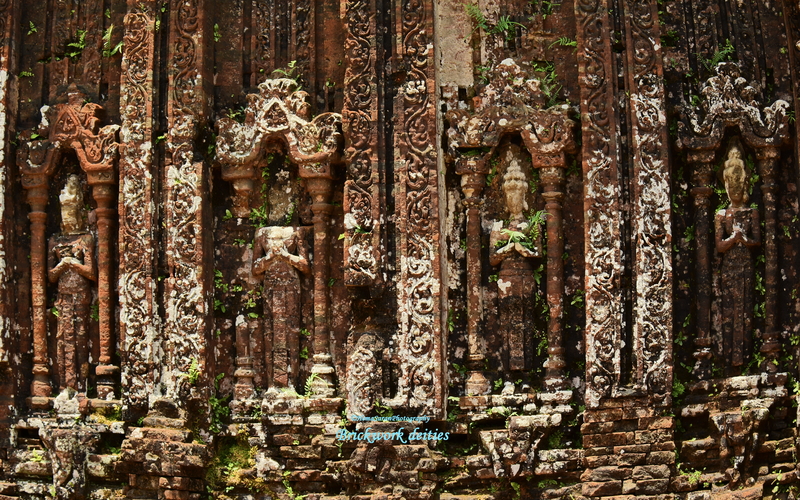 The Champa architecture used the Corbel structure to build temples. In Corbel architecture, the successive courses of brick layering were done by setting the bricks slightly off from the preceding layer giving the tower-like look. Though the Corbel architecture was not self supporting, a lot of civilizations across the globe and across various eras have used this architecture to build grand structures. Some of the very famous structures that used Corbel architecture are Newgrange passage of Ireland, the Pyramids of ancient Egypt, Tel Megiddo in Palestine, Treasury of Atreus and Arkadiko bridge in Greece, Tomb of Sultan Ghori in India, Borobudur temple in Indonesia, Temples of Angkor in Cambodia. The Chams used baked bricks for the main construction. The Champa architecture typically had a flat foundation for the main sanctuary, rectangular stella and tri-level pyramidal roof. The Champa architecture was sublime and subtle. They did not build temples of grandeur or intricate carvings. Sandstone sculptures decorated the towers and motifs were carved into the brick walls. The Champa architecture was greatly influenced by Indian style of Sikhara (called Vimana in South India) architecture. In most of the Champa temples, Kalan is dedicated to the Yoni-Linga structure housed in the sanctum sanctorum, a narrow square room with a pyramid like roof. The roof of a temple represents the top of Mount Meru, the abode of Gods. The Kalan usually faced the east as in Hindu temple architecture. The Kalans of My Son are unique as they face both the East and the West. The Champs had many secrets for building tall temples. 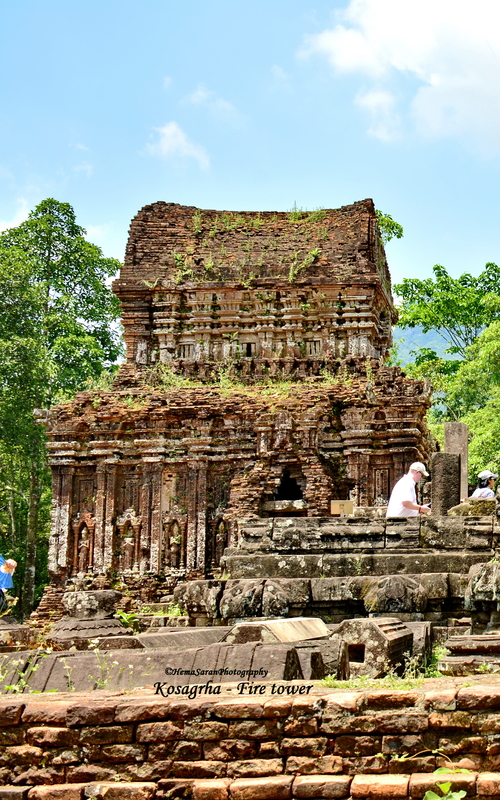 They had used resin from the nearby jungle to build these temples. The Dan-rai resin is a waterproof natural glue that has great strength. This resin is still in use today as it is cheap and easily available. Fishermen coat a paste of this resin mixed with powdered shell on the hull of their boats. My Son E1 – My Son E1 style of architecture is perhaps the earliest style of architecture used in the My Son temple complex. It influenced by many old style of architectures like the Pre-Angkorian Khmer, Dvaravati of Indonesia and South Indian architecture. The most identifiable piece of sculpture of My Son E1 style is the large sandstone pedestal dated from the second half of the 7th century. The pedestal supporting the Lingam is decorated with relief carvings of a monk preaching to animals, a sage receiving news or an ascetic playing musical instrument etc. The pedestal symbolizes Mount Kailasa, the mythological abode of Lord Shiva which is also home to the monks, sages and ascetics, just as the Lingam it supported represented the god himself. Hoa Lai Architecture – This school of architecture typically has a tower with broad base, a hollow tower is created by stacking bricks tapering at the top, a sanctum sanctorum houses a Linga and Yoni dedicated to worship of Lord Shiva in tower A, a tower B houses the Nandi bull and a fire tower, tower C dedicated to Lord of fire, Agni. Dong Duong – The Dong Duong style of sculpture is an original style that has excessively stylized features. The carvings have thick noses and lips. Also these carvings are more sombre and do not have a smile on the lips. 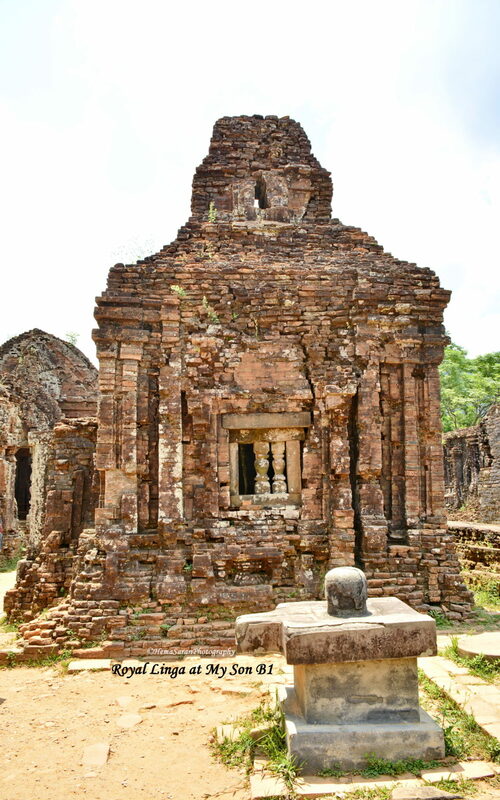 My Son A1 – The My Son A1 style of architecture succeeded the Dong Duong style of architecture during the revival of Hinduism in Vietnam in 10th and 11th centuries. Mỹ Sơn A1 style is very graceful, delicate and light. It is greatly in contrast to the preceding Dong Duong style of sculpture which was a bit harsh. The carvings are artistic, yet not showy. Today 3 temples in Saigon (Ho Chi Minh City) built by Tamil traders in 19th century are used by 2000 Indian Hindus, mainly Tamil Chettiar community, living there. 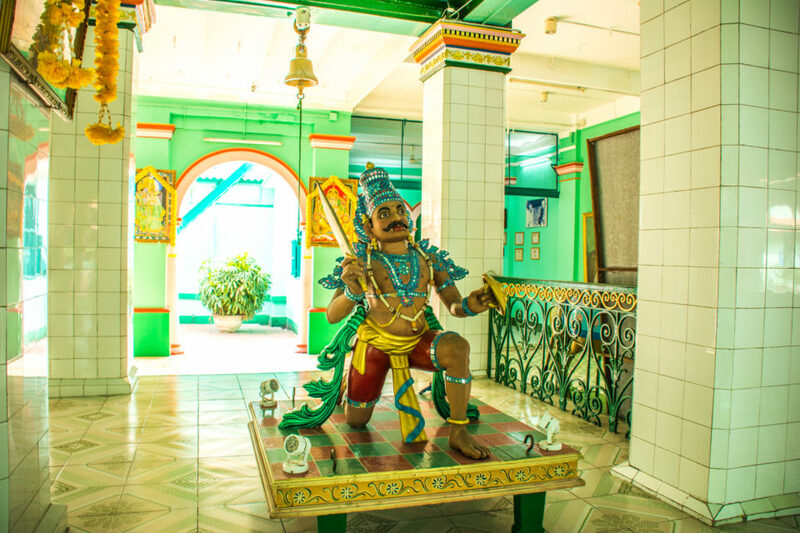 There temples are Mariamman temple, Thendayuthapani temple and Subramanian temple. Apart from My Son, Po Nagar Hindu temple complex are the remaining artifacts leftover from the Cham Kingdom. As for the people themselves, the Hindu Chams have difficulties surviving in the modern world as a community as there is not much support from the Hindu communities from outside of Vietnam, whereas the Muslim Chams are thriving as they have very strong financial ties across the world and are united with their Muslim brethren around the world under Ummah. 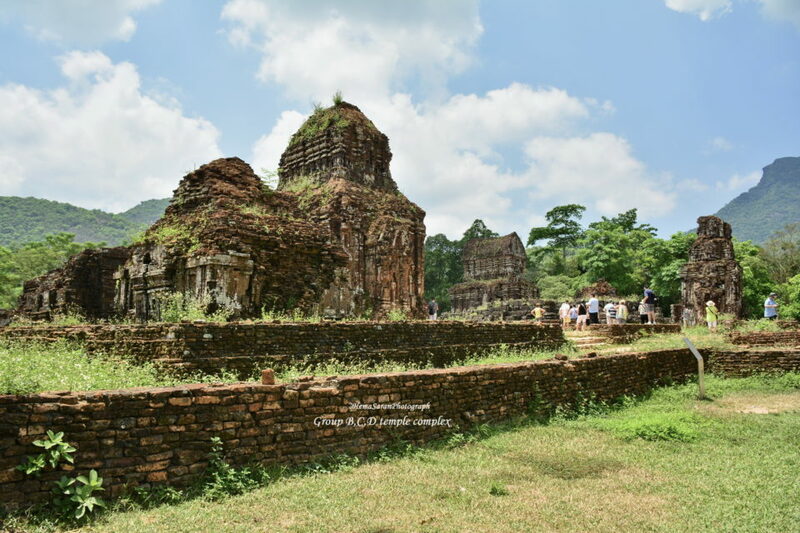 I traveled to the My Son Temple complex from Hoi An through a tour company for a half day guided tour. I would suggest anyone interested to do the same if you are in a hurry. If you have some spare time, then I would suggest taking a bike trip to the ruins and exploring it in leisure. One-way trip is about 36 kms only. I had to zip through my photography session as the other people in the tour just wanted to take selfies and just rush through the whole complex quickly. I used Hoi An, the ancient port city and an UNESCO site, as my base to travel to all the places. Hoi An in itself is beautiful ancient port to experience. I stayed in the Earth Villa hotel outside of Hoi An ancient town. If you are traveling during hot summer months remember to carry a bottle of water right as there are no shops inside the complex. Carry a hat, sunscreen and a camera. Follow your tour guide and memorize the little flag he carries as multiple tours start and end at the same time. The tour guides walk briskly and so you have to keep up. I did not see a single kid in this tour so people with little children beware. There are no restrooms inside the complex and it does take about 2 hours to cover the entire temple complex. The tour guides are simple and knowledgeable, but they will always give out a set parameter of knowledge to people, they love it when people ask questions, so go ahead and ask them as many questions as you want. Please remember to tip them a dollar or two as it goes a long way to help them and the tips are never included in the ticket prices. My Son is open daily from 6:30 AM to 4:30 PM and the visit to My Son is not free. The admission price into the Temple complex is 60.000VND (3 USD roughly). This fee includes electric car transport to and from the heritage site. Very nice travelogue . Keep writing.